Bring a calming, natural presence and a sense of wonder to your office or home with this work of sand art. Ever changing, this sand art is an awesome microcosm of natural elements and landscapes. 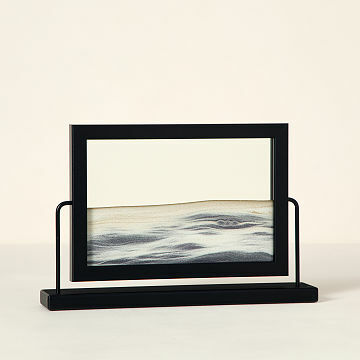 Give the frame a gentle tilt or a more extreme angle and watch as the flow and speed of the falling sands form tiny deserts, mountains, clouds, rain, oceans and smoke, all ebbing and flowing into one another. There is an eternal and yet fleeting quality about this interactive art, and the sparkling sand will mesmerize as it becomes a tiny primordial universe right there on your desk. Created by Klaus Bosch and handmade in Austria, this inventive artwork will bring a calming, natural presence and a sense of wonder to your office or home. Available in Black Beech Wood or Natural Beech Wood - sold separately. Click here to see it turning. Click here to view the windows in action! And click here for instructions. Includes a small syringe with needle for adding and removing water and air, which helps regulate and maintain the device and makes sand flow more slowly or more quickly. Regulation, which is rarely required, should be done by adults only. Instructions included. 13" L x 2.4" W x 8.5" H; 2.8 lbs. My husband glue the top/bottom piece of the frame back on, the item was well packaged so I believe it was not due to shipping. Thankfully the glass was encased so the sand did not come out. Item would have received a 5 star had the frame not come apart. Very unique and professional gift. Receiver of gift will be impressed! While I'm making making dinner this is great to keep him from trying to help me. Helps reduce stress of a difficult job. Treated Myself to a GREAT gift!!!! It's very calming, for me and my customers!!! We would certainly purchase this product again. The constantly changing nature of this product gives it a life of its own. It's fun to watch, and to return to. After buying the desktop sand art item, it just made me want to buy all sorts of sand art. I wanted sand art I could hang on my wall, sand art I could keep in my kitchen, my bathroom, and maybe even outdoors! I bought it as a gift, but wish I could keep it for myself. Purchased for my managers nephrology nurses week. I was in the zen/peaceful mindset when giving gifts this year and the sand windows were a hit with all of them.